While browsing the Chowhound Prairie Provinces forum I came upon a post meant to let all us ‘foodies’ know about the upcoming event, Big Taste Calgary. I say ‘foodies’ lightly because there are often negative connotations with the term, but for me it just means people who seriously love food. The Big Taste Calgary is a ten day foodie event where you can sample multi course and set menus at over 70 restaurants in Calgary. There are nine major ticketed events ranging from multi course meals, to brew pub style, and a culinary class at SAIT Culinary Campus. I posted the event up on my Facebook account hoping I could convince one of my friends into going with me to one of the events held this week. A friend accepted and we made plans and bought tickets to attend the River Cafe event on March 4. I had never been to River Cafe though I had heard tales of some really delicious and local food coming out of the kitchen there. I arrived early to find our host, John Gilchrist, seated at his table already. John Gilchrist pretty much has the best job in the Calgary foodie world. He is a writer and reviewer working for the Calgary Herald and CBC Radio One. My friend remarked that maybe his eating out for his job all the time would get boring or tedious. I beg to differ. Mr. Gilchrist’s job today was to describe each course, including the provenance of some of the components of the dishes. River Cafe is the only restaurant located on Prince’s Island Park situated on the Bow River. It has undergone many transformations to elevate it from a lowly park concession selling hot dogs to the rustic and romantic restaurant dedicated to serving only the very best regional and local ingredients. Today I was seated at a table for six, family style. My friend and I enjoyed the company of the strangers sitting with us and as we discovered just how much we all shared in common, we became one in our enjoyment and wonder of the breathtaking meal laid before us. We were strangers no longer. I must apologise because I really can’t accurately describe the flavours of the dishes due to illness. There were some standout flavours that I could taste but I’m sure I would have more accurately described the dishes had I not been ill. Such is life. We began with an oyster for Course One. I have so far managed to avoid eating oysters, mussels and clams but there are situations where they just can not be avoided. This was one such situation. 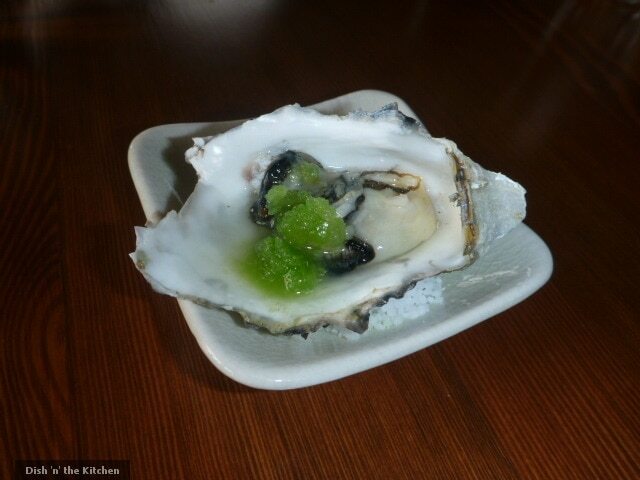 The oyster was freshly shucked, briny and topped with a cucumber and long pepper granita. I tore the oyster away from the shell with the seafood fork and decided it was all or nothing. I think maybe though it would have been prudent to remember my hubby’s previous advice to not chew the oyster. I did chew and the texture was really not my thing. Really. Eventually I just swallowed the whole oyster down getting some salt and vinegar tastes with a hint of metal. It was really what I had expected it to be. After I thought about it for a while I decided that maybe I could learn to tolerate or even like oysters. They really aren’t that bad after all. I was delighted to find out that each course of our meal was to also have an accompanying wine and that they would all be introduced by Craig Faas. We had a 2011 Quail’s Gate Riesling paired with our oyster and our next course which was an Okanagan Beet, Honeycrisp apple, and Sunchoke salad. I didn’t get any of the complexities of the wine, I’m sad to say. It served me well to wash down the two courses. I’ll have to make a point to purchase a bottle and try it when I am well. The salad, however, was lovely. I really enjoyed the balance of flavours and textures at play. 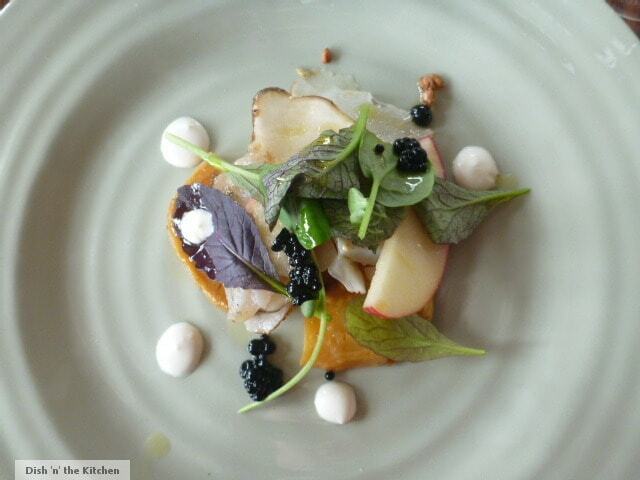 The crispness and sweetness of the apple and sunchoke went well with the salt and chewy texture of the smoked pickerel. I’m afraid I hardly noticed the little dots of creme fraiche circling the plate. I think in this case, more would have been needed to add to the dish. I did absolutely love the little pearls of balsamic vinegar and the crunchy grains. There were several of us at the table who wished for more of these grains on the plate. The waitstaff whisked away our wine glasses and plates so that we could start on the next course. I give kudos to them because they were absolutely flawless in filling our glasses and keeping an eye out for finished plates. The next course was paired with a 2011 Chardonnay also from Quail’s Gate. I’m not really sure what the course was. Soup? Stew? 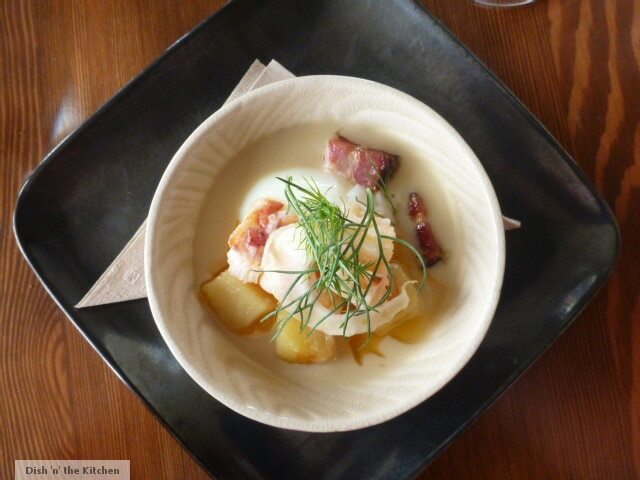 It consisted of an egg, cooked for an hour at 64C, lobster, cauliflower cream, pickled fennel and bacon lardons. I liked each component separately and I was really excited to try the slow cooked egg. It really was soft and velvety like I had imagined. I think what really bothered me about this dish was the excess ‘gooey’ texture brought in by the egg and the cauliflower cream. I think when there is an egg done to such perfection it should stand alone. When broken, the egg can create its own sauce for the dish. 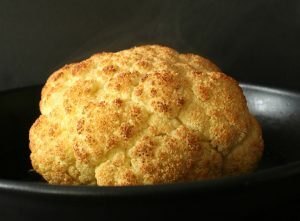 The cauliflower cream was redundant. Our final course really turned out to be my favourite. I’m sure everyone at my table was in agreement that the slow braised (18 hours!) beef shoulder from ‘Bite Beef’ was the star of the show. One nudge from my fork and it fell apart. I went weak at the knees so it was a good thing I was sitting down. I don’t know what they used for the braising liquid but it was definitely something I would like to try and make at home. The roasted cipollini onion and radishes were also standout. I would never even have thought to roast radishes but now I can’t wait for that first radish crop of spring to try it out myself. The picked huckleberries perched on top of the beef added a slightly sweet/sour element to the dish. We all remarked how they would have been sorely missed had they not been present. This beef course was paired accordingly with a 2008 Burrowing Owl Meritage, a blend of five varieties of which the largest is Merlot. Desert was a ‘to go’ bag of cookies. I was somewhat disappointed that we wouldn’t get a chance to see the sweet side of River Cafe. After the last course the room appeared to clear out quite rapidly so it was then that I understood the reasoning behind our ‘baggies to go’. It seemed everyone had some place else to be on this snowy Monday. After I got home I made myself a cuppa and tried out the biscuits. One was an oatmeal/chocolate chip cookie, the other was cranberry and lemon with quinoa. I don’t think the quinoa was the main ingredient but rather served in more of a visual and textural manner. 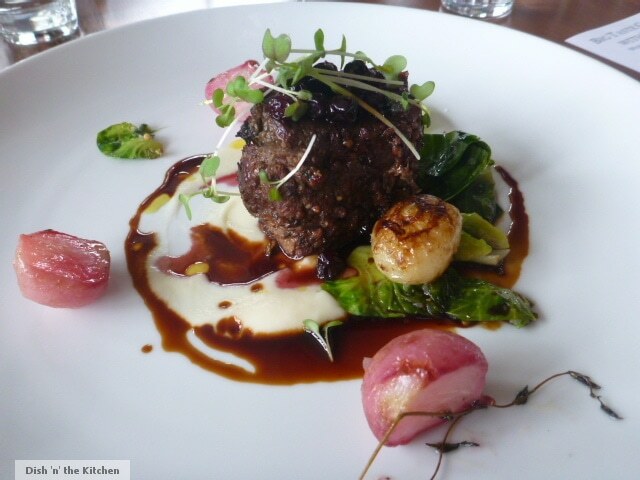 Great review – I’ve always wanted to try River Cafe, I’ll have to make it a priority. As for the review itself, I really appreciate the balanced nature: not overly critical, but not gushy either. Well thought out and presented. Thank you so much Lisa. River Cafe has been on my ‘to visit’ list for a long while now so I was really glad to have the opportunity to visit during the event. This blog is very new so I’m still learning the ropes and positive feedback like yours really makes my day. Cheers!